Kozhikode: Kerala Blasters FC have landed in a controversy soon after their opening match of their pre-season tour in Thailand as Bangkok FC, the team which Blasters claimed to have defeated 4-1, denied playing against the Indian Super League side on Sunday. In a major embarrassment to Blasters, the Thai League 3 club posted on social media sites that they had never played against the Kerala side. 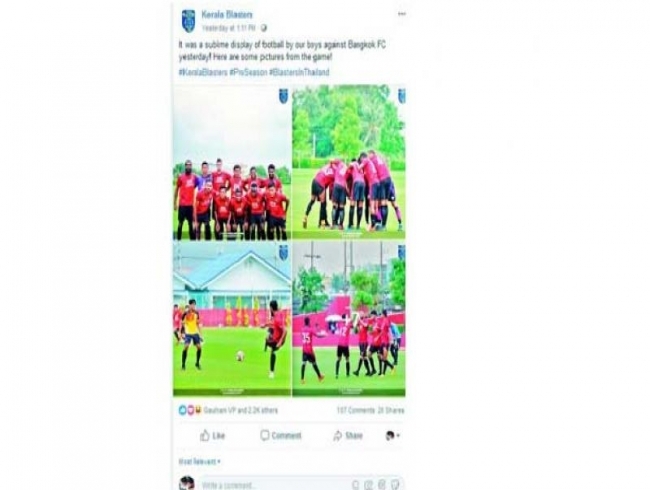 The Thai club also requested the Blasters to remove the logo and results from the social media sites and informed the Kerala fans that their team had played against a university team, Bangkok Thonburi University. The club’s social media handles also posted that they were getting so many enquiries about the match and asked the Blasters to clarify on the matter. Even hours after Thai Club’s request and thousands of messages by the Kerala fans to reveal the truth, there has not been any response from the Kerala Blasters FC. Fans questioned the legitimacy of the tour and questioned the management on social media for playing the ISL team against a university team in Thailand. The team coached by David James claimed that goals from Seminlen Doungel, Sahal Abdusamad, Slavisa Stojanovic and Shaiborlang Kharpan had sealed the win while for the Thai side Theerapak Punboonchu scored the only goal on Friday. Earlier, the Jamshedpur FC side also erred on the name of the club they had played against but was quick to apologise after the mistake was pointed out.